Liberty Church has been walking people through the Dave Ramsey courses for over 15 years. Our classes watch Dave’s videos in a large group setting and break out into small groups for in-depth discussion. Registration for FPU begins in January. The class runs from 1/28 - 3/25 7 pm to 9 pm and registration for Legacy is in late August. 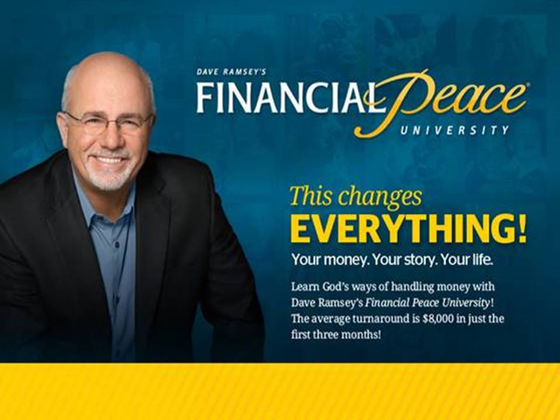 More than 1 million families have completed Financial Peace University (FPU). Dave Ramsey is amazingly practical and hilarious at the same time. He gives biblical, practical steps to get from where you are to where you've dreamed you could be. This plan will show you how to get rid of debt, manage your money, spend and save wisely, and much more!